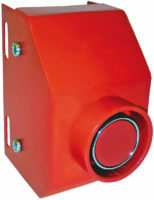 The pedestrian calling device KOMKON KVP is designed for switching pedestrian phase at traffic light installation. The device is implemented in accordance with the requirements of DSTU 4157-2003. KVP commutes low voltage signals (5V, 12V, 24V). The operational temperature range – from -40 to +85ºС. The class of jacket protection from the ingress of dust and dampness – IP54. The chase is made in the anti-vandal construction of steel 1.5 mm thick. Marking of outputs: red – «plus», blue – «minus».